The night sky is set to be lit by a spectacular celestial sight this month, as the Orionid meteor shower passes overhead. The show of shooting stars happens when Earth passes through the debris of Halley's comet, on its journey around the Sun. As it does, the meteoroids collide with Earth's atmosphere at 148,000mph and burn up in streaks of light that are visible across the night sky. That means that it happens at the same time ever year. They are most visible around 21 and 22 October, though they should be able to be spotted in the few days before and after that. They do actually get started very early in the month, and will run as long as 7 November. So it's possible that you might spot part of the Orionids any time from now until 7 November. And while 21 October marks the peak of the show, the Moon might mean you're more likely to see them the week before. Around the middle of the month, it will get out of the way in the sky and make it easier for the Orionids to shine through. 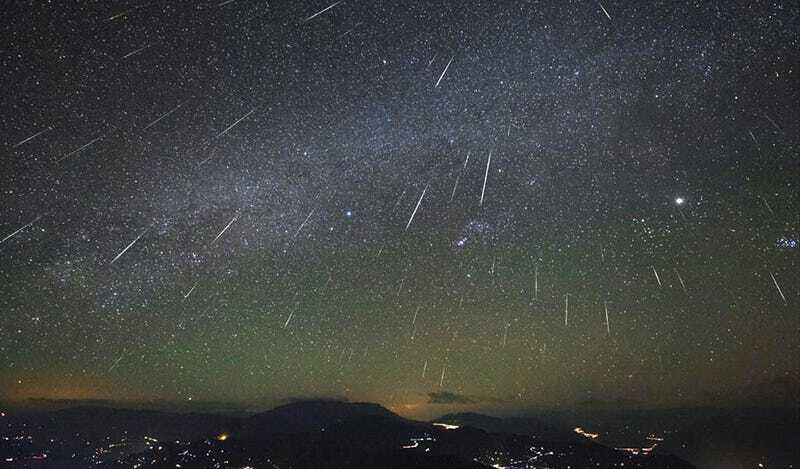 At their peak, the Orionids could see as many as 20 of the meteors streaking across the sky. That makes it a relatively muted meteor shower compared with some of the other annual displays, but it still should be visible for the ground. And what they might lack in quantity they can make up for in quantity: the Orionids are known in particular for the brilliance of some of their lights, making them especially easy to spot. As ever, astronomers recommend heading out to somewhere with relatively little light pollution so that the night sky is more visible. Find somewhere dark and allow your eyes to adjust before looking up into the sky – wherever you'd like, and with no special equipment needed at all. In keeping with their name, the meteor shower will be most visible from famous constellation of Orion. But in practise, you can look just about wherever you want – and some experts recommend looking up with friends, so that you can survey the entire sky at once.